Syrian civil defense members search near a burned vehicle and personal belongings at a site in Hass town after an airstrike in the southern part of Syria's Idlib province, Sept. 8, 2018. Russia and Syria launched airstrikes Saturday on Syria's last rebel stronghold of Idlib, killing at least four civilians in what a war monitoring group said were the most intense attacks in a month. The Syrian Observatory for Human Rights said aircraft carried out about 60 raids in less than three hours on southern areas of the densely-populated stronghold. Observatory head Rami Abdel Rahman said some of the jihadist and rebel facilities were in use when the attacks occurred. Rahman said the attacks were the "most violent" since an August 10 bombardment killed at least 53 civilians, including children, in Idlib and in the nearby province of Aleppo. Idlib and neighboring areas are mostly controlled by several rival rebel groups, including Hayat Tahrir al-Sham, an alliance led by militant group al-Qaida's former Syrian affiliate. Also Saturday, Russia said it had "irrefutable information" that Syrian rebels were planning "provocations" in Idlib to justify a response from Western nations. "Those taking part in the staging of provocations should be fully ready by the evening of September 8," said Russian Ministry of Defense spokesman Igor Konashenkov. 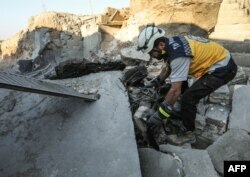 Konashenkov said "terrorist" groups had gathered in Idlib and were being helped by the White Helmets, a volunteer rescue group officially known as the Syria Civil Defense. Moscow has long said rebel groups in Idlib were planning an attack on civilians, as Russian and Syrian attacks on the province escalate. Saturday's airstrikes and Moscow's statement came one day after Turkey again warned a "bloodbath" would result from any Syrian government military offensive on Idlib. Turkish President Tayyip Erdogan speaks during a news conference with President Hassan Rouhani of Iran and Vladimir Putin of Russia following their meeting in Tehran, Iran, Sept. 7, 2018. 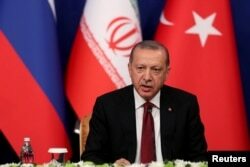 Turkish President Recep Tayyip Erdogan repeated that warning Friday as a trilateral summit involving his country and Russia, and hosted by Iran, appeared to end in deadlock over efforts to avert conflict in the Idlib enclave. "We never want Idlib to turn into a bloodbath," Erdogan said at a news conference with his Russian and Iranian counterparts. "Any attack launched or to be launched on Idlib will result in a disaster, massacre and a very big humanitarian tragedy," Erdogan added. Syrian forces have been massing around Idlib, backed by Russian air power and naval might. The Tehran summit was touted as the last chance to avoid the looming military operation. Iran and Russia maintain that Damascus is right to deal with terrorist threats. "Fighting terrorism in Idlib is an unavoidable part of the mission of restoring peace and stability to Syria," Iranian President Hassan Rouhani said at the press conference, adding, "but this battle must not cause civilians to suffer or lead to a scorched earth policy." "The legitimate Syrian government has a right and must eventually take control of its entire national territory," Russian President Vladimir Putin said, supporting his Iranian counterpart. Russian bombers this week started to target Idlib ahead of an expected ground operation. Around 3 million civilians are believed to be trapped in the enclave bordering Turkey. Erdogan warned that with Turkey hosting millions of Syrian refugees, it cannot take in any others. "That [Idlib attack] would lead to a humanitarian wave adding to existing refugees, but because of the nature with Idlib, some of these refugees would be people associated with jihadist groups," said political analyst Sinan Ulgen, head of the Istanbul-based Edam research institution. "So it represents not only a humanitarian burden on Turkey, but also a very significant security risk going forward," he added. "So that is a scenario Turkey wants to prevent and relies on Russia's support." At the Tehran summit, Erdogan proposed a cease-fire in which the radical jihadist groups could be disarmed and removed from the region. Ankara is one of the main backers of the Syrian rebels, developing strong ties with myriad warring opposition groups. 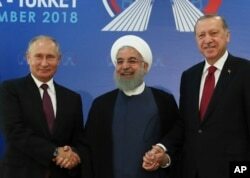 Turkey's relations with the opposition made it a key partner with Russia and Iran in their efforts to end the Syrian civil war under the so-called "Astana Process." Displaced Syrians are seen at a camp in Kafr Lusin near the Bab al-Hawa border crossing with Turkey in the northern part of Syria's rebel-held Idlib province on Sept. 6, 2018. Idlib is the last of four de-escalation zones created under the auspices of the Astana Process in which rebels and their families were transferred to designated areas protected by a cease-fire. Much to Ankara's anger, the other de-escalation zones were overrun by Syrian government forces and Russian airpower, the fate now awaiting Idlib. Twelve Turkish military outposts are located in the Idlib enclave as part of the agreement to create the de-escalation zone with Tehran and Moscow. Speaking in Tehran, Erdogan reiterated that the military posts were to protect civilians. Some analysts suggest that could be a thinly veiled warning. On Thursday, Ibrahim Karagul, a columnist closely linked to Erdogan, was more direct. "A possible attack on these military posts (in Idlib) or provocation by the Damascus administration or the PKK (Kurdistan Workers Party) and other organizations that act in cooperation with the regime will be met with an extremely harsh reaction from Turkey — just as it should be," wrote Karagul the pro-government Yeni Safak newspaper. Turkey considers the PKK a terrorist group. The PKK has been waging a long-running insurgency in southeastern Turkey. Earlier this year, a senior adviser to Erdogan warned against any attack on Idlib, describing it as a "red line." In the last couple of weeks, Ankara has been reinforcing its military presence in Idlib, reportedly including deployment of anti-aircraft missiles. Turkish tanks are also being deployed on the enclave's border, ostensibly to deal with a refugee exodus. Ankara's cooperation with Moscow on Syria has been the basis of a broader deepening of bilateral ties, at the same time as U.S.-Turkish relations deteriorate. Ties have been strained in part over Turkey's detention of a U.S. pastor whose release the United States has demanded. Turkey is calling on the U.S. to extradite a cleric accused of involvement in a 2016 coup attempt against Erdogan. The cleric, Fethullah Gulen, denies the accusation. Idlib, however, is providing rare common ground between Ankara and Washington, with U.S. President Donald Trump warning against a major offensive on the enclave; however, given what analysts suggest is the improbability of any U.S. military intervention, Ankara will be reluctant to sacrifice its ties with Moscow. "Ankara needs to be realistic. It cannot totally alienate itself from Russia, given that it still needs Russia as a partner in Syria," analyst Ulgen said. "Turkey would not want to find itself in a position it can no longer cooperate with Russia, because of their other concerns regarding Syria." An earlier version of this story misspelled Ibrahim Karagul's name. VOA regrets the error.